Authors: H. M. Cegla, C. A. Watson, S. Shelyag et al. The Sun is whizzing around the Milky Way at about 500,000 miles per hour. A Galápagos tortoise, which is the opposite of the Sun, ambles along at about 0.2 miles per hour. 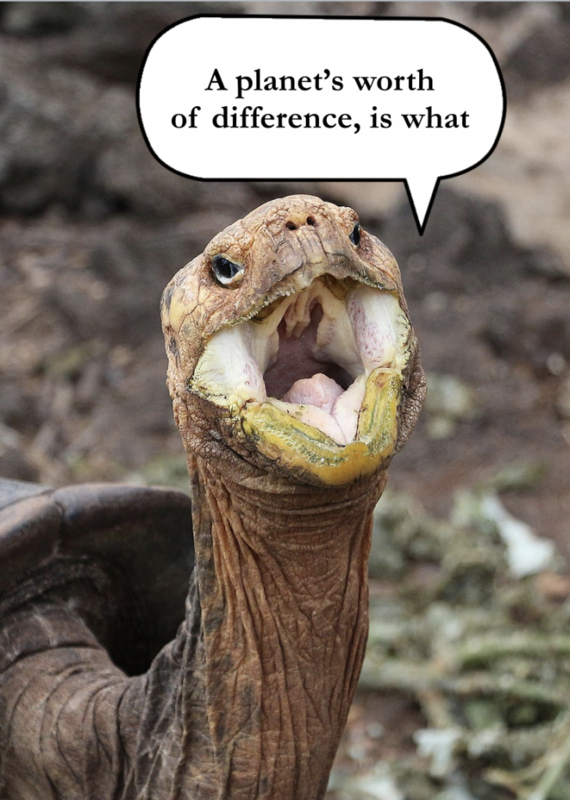 One might reasonably conclude that the speed of a Galápagos tortoise is completely irrelevant compared to the speed of the Sun–if the Sun were to speed up or slow down by a tortoise-speed or two, what difference would it really make? Earth, for example, pulls on the Sun to the tune of 0.4 miles per hour. Imagine an alien, far away, watching the Sun approach: at the time of year when Earth’s gravity swung the Sun forward, towards her, she would clock the Sun going 0.4 miles per hour faster than she would six months later. Spectrographs here on Earth are getting good enough to detect velocity shifts as small as that. The newest ones—ESPRESSO and EXPRES, among others in various stages of design and construction—aim to measure tortoise-speed shifts in radial velocity (in more professional units, shifts of 10 centimeters per second), which should reveal a whole population of Earth-like planets lurking around the stars they’re aimed at. The problem is that tortoise-speed velocity shifts are not necessarily the result of orbiting planets. Stellar surfaces are bubbling, boiling messes—hot “granules” of plasma bubble up from the sweltering depths, then cool and sink back down again. Meanwhile, the bubbling in the upper layers is forceful enough that the entire surface reverberates, expanding and shrinking to the bubbling beat. All of that bubbling and oscillating can wobble the star more than an orbiting planet does, and confuse us in our attempts to find other Earths. 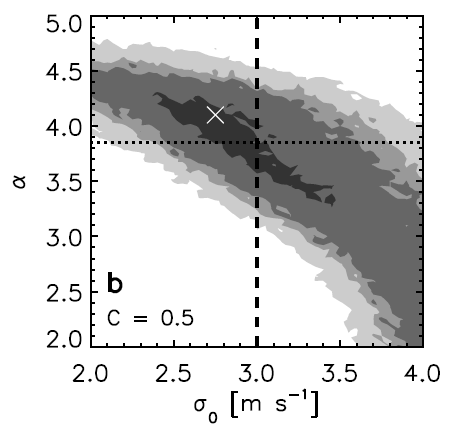 Today’s authors ask: How well do we actually understand the radial velocity of a stellar surface? In particular, how well do we understand the radial velocity signals coming from the center of a star, compared to those coming from the edge? Below is a snapshot of a stellar surface, simulated by the authors. In the left column is the middle of the star: our line-of-sight is at a 0-degree angle with a line pointing straight up from the surface of the star. In the right column is a little piece of star considerably farther out toward the edge, or the “limb.” Here, our line-of-sight makes a 60-degree angle with a line pointing up out of the surface. Figure 2. 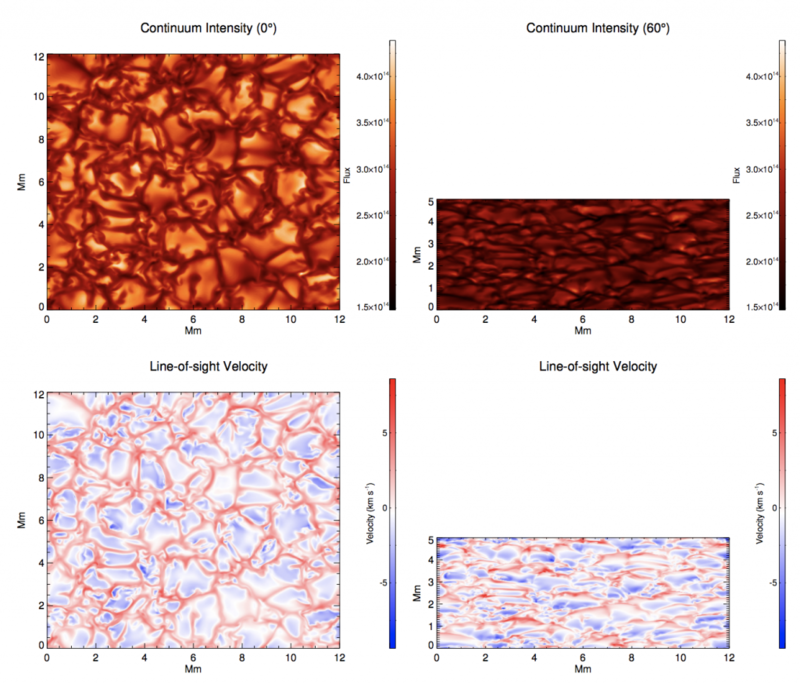 Top: Maps of the intensity of light coming from a simulated stellar surface viewed straight-on (left) and at a 60-degree limb angle (right). Bottom: Radial velocity signatures of the stellar surface, in kilometers per second. Blue regions are moving toward the observer, i.e. outward from the surface of the star; red regions are moving inward, away from the observer. Limb darkening: The outer layers of the star are somewhat transparent, and as you go from the stellar limb toward the center of the star, your gaze penetrates ever-deeper, ever-hotter, ever-brighter layers of the stellar interior. As a result, the entire surface is brighter at 0 degrees than at 60. Viewing angle: The granules, or the bright bubbles of hot plasma, always rise straight up toward the surface. But as your viewing angle onto the surface changes, your perception of that motion changes, too—while a bubble at the center of the star is strongly blueshifted because it’s moving directly towards you, a bubble exactly at the stellar limb is actually moving perpendicular to your line of sight, so it imparts no radial velocity signature. Corrugation: Granules stand out above the stellar surface, like hills. From a top-down view, that doesn’t matter, but from a side-on view, the granules block the view of the redshifted “valleys” beneath. Together, these effects conspire to change the shape and position of absorption lines in the stellar spectrum. A line measured at the center of the star will be different from one measured at the limb. Consider, for example, the contribution to the line coming from the granules: because of the corrugation effect, the granules become the most visible piece of the stellar surface as you move toward the limb, and because of the viewing angle effect, the granules at the limb appear less blueshifted than their counterparts at the stellar center, even as they limb-darken. So overall, a granule spectrum at the limb is dimmer and redder than its central counterpart, and since the overall stellar spectrum is made by adding up the spectra of granules and other surface features (weighted how bright they are), the overall spectrum changes, too. 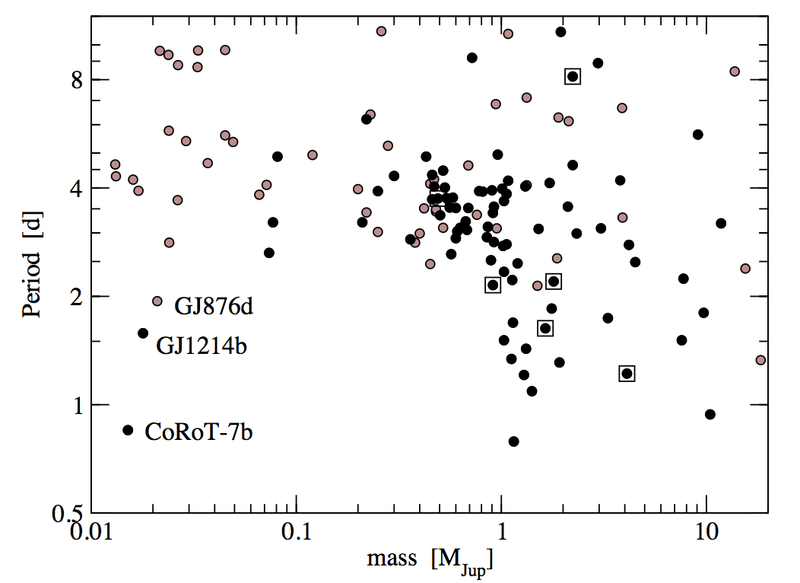 Keeping this in mind, the authors of this paper are currently working to build up a library of the spectra and radial velocity signatures we might expect from a whole host of different types of stars. Good news for conscientious planet hunters–we’re one step closer to understanding the noise in our radial velocity observations! Interesting, and thanks for summarizing this paper! I’m working on measuring incredibly tiny shifts in stellar spectral lines for my Ph.D. and this is the sort of thing we have to consider (though I’m using it to search for changes in the strength of the fine-structure constant rather than signatures of planets). I’ve been coming to realize that stars are a whole lot more complicated than I realized!